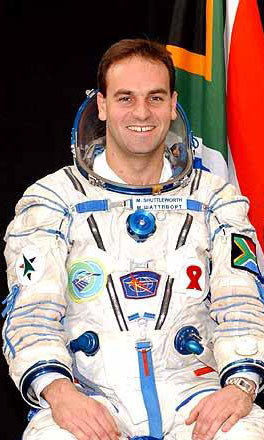 Mark Shuttleworth ZSRSA was the first African to go into space. On April 26, 2002 he traveled to the ISS and had contacts in the 144 MHz band with schools in South Africa as well as radio amateurs back on Earth. Mark was born in the dusty gold-mining town of Welkom in South Africa, and grew up in Cape Town. His fascination with technology started at a tender age when he discovered computer games, and not too much has changed in that respect. His interest in science covers an eclectic selection of disciplines, in particular particle physics, software engineering, digital media and biotechnology. On April 29 Shuttleworth spoke with students at Bishops College–his alma mater–marking the first ARISS QSO with a school in Africa. Shuttleworth also thrilled several US amateurs by showing up unannounced on 2 meters during a North American pass May 1. Shuttleworth’s solo casual operation–at the encouragement of ARISS–resulted in a string of contacts. “As you can imagine, I was thrilled to work him,” said Stan Vandiver, W4SV, who was at or very near the head of the line in working Shuttleworth. “He was doing a pretty good job fielding the calls.” Those who routinely monitor the ISS 145.800 MHz FM downlink frequency got a hint that something was up when they began hearing Shuttleworth’s UK-accented English instead of packet bursts. “Wow!” was the simple reaction of Bruce Weaver, K3LTM, the advisor to the Cowanesque Valley School Amateur Radio Club in Knoxville, Pennsylvania, after the school’s KB3BRT club station made its own brief contact with Shuttleworth. Among several other stations, Shuttleworth also spoke briefly with ARISS International Group Chairman Frank Bauer, KA3HDO. “Thanks, Frank. Thanks very much for your help with A-R-I-S-S,” Shuttleworth said, spelling out the acronym. During a May 2 ARISS QSO with students gathered in Gauteng, South Africa, Shuttleworth spoke at some length about his research projects. He described one experiment from the University of Stellenbosch as especially challenging and ambitious.